Today is Armed Forces Day, when we honor those who currently serve, or previously served, in the Army, Navy, Marines, Air Force, Coast Guard, National Guard, and Reserve units. 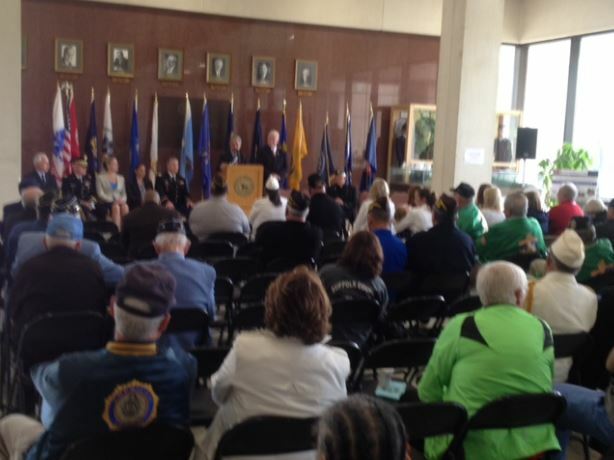 The national theme of this years’ recognition events is “Honor those who answered the call to serve.” To commemorate, Suffolk County held an inspiring event at the H. Lee Dennison Building, facilitated by the County’s Veterans Service Agency Director Tom Ronayne. As a culture, I think we have diminished the definition of “courage.” We associate courage today with acts of being truthful and forthright, being outspoken, a presence on reality TV shows, making winning plays on an athletic field, or simply doing our daily job responsibly. Colonel Francis Kestler, who is also a Gold Star parent, reminded the gathering of the courageous service of those who have made their stand for our country “in the arena,” preparing, facing, or even succumbing to live fire. Meanwhile, their families provide support, understanding, and grief knowing the unique, courageous call to service of their loved one. So, as we observe the holidays this year that give honor and recognition to our Veterans, their military accomplishments, and the freedoms that we as Americans enjoy, let’s also consider the “high bar” the families of our servicemen and women have set for determination and courage, and how their service allows us to experience what is truly possible for human achievement.